Home / International Football / Asia / India Women open 2020 Olympics Qualifying campaign with 1-1 draw against Nepal! 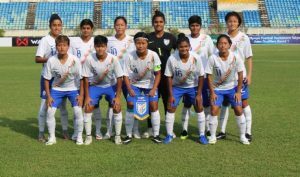 The Indian senior national women’s team began its campaign in the first round of the 2020 AFC Women’s Olympic Qualifying Tournament with a 1-1 draw against Nepal on Thursday, November 8 at the Thuwunna Stadium in Yangon. Team India responded to the early setback and created a flurry of chances in the next few phases of play, with Grace Dangmei exerting a lot of influence down the right wing and the likes of Sanju, Anju Tamang and Bala Devi all coming close to opening the scoring for Maymol Rocky’s side. The second half saw India start off on the front foot as Kamala’s volley from the penalty box arc went inches over the bar. At the hour mark, Aditi proved her worth yet again with a fine save as she denied Nepal striker Sabitra from just eight yards out. Previous XtraTime VIDEO: Is Mohun Bagan already under pressure in I-League! Next Mohammedan Sporting beat Oil India FC to win 65th Bordoloi Trophy!